Bangkok’s 'winter' beer garden at Central World runs from the beginning of November trough to January every year, taking advantage of the 'cooler' temperatures and festivities during the build up to Christmas and New Year. 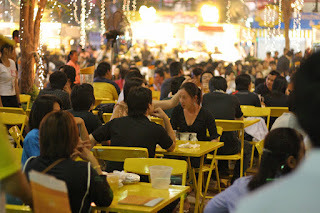 The event uses the huge space in front of Central World mall, with multiple sponsored sections offering alfresco seating, live music stages and lot and lots of beer. Domestic brands as Chang and Singha as well as Dutch giants Heineken set up their own areas. Each one has a busy timetable of live performances with some of the biggest artists in Thailand playing across two months.